Last night, the U.S. House of Representatives unanimously passed by voice vote an amendment to a transportation funding bill—and did so in 3 minutes from the amendment submission to the vote. Not surprisingly, the amendment didn’t do anything controversial. It simply stated that for the Department of Transportation to approve a foreign air carrier permit application, the permit cannot contravene United States law or Article 17 bis of the U.S.–E.U.–Iceland–Norway Air Transport Agreement. In short, the amendment, which ALPA aggressively supported, enforces the existing law without mentioning any specific airline or operation. It’s not shocking that there was unanimity among both parties that voted to support the Westmoreland-DeFazio amendment that prohibits shopping for cheap labor and simply requires the Department of Transportation to follow the law and provisions agreed to in the U.S.-EU Transport Agreement. Read ALPA’s statement. But pay attention to who opposed the amendment: Norwegian Air International (NAI) launched an aggressive lobbying campaign to defeat this straightforward amendment. Which leaves one to ask Why? Because NAI knows that if DOT follows the law, then its application for a new foreign air carrier permit will be denied because it doesn’t meet the legal standard set forth in U.S. and international law. The fact is, when Norwegian launched its service to the United States last May, ALPA did not object. It was only when Norwegian attempted to move its operation outside of Norway six months later to establish a flag-of-convenience airlinein Ireland to avoid Norwegian labor, tax and regulatory laws did we object, and that objection was only to the new business model, not to Norwegian’s existing service to the United States. Norwegian’s attempt to confuse ALPA’s position has been a desperate effort to distract from the core issues and illustrates perfectly how Norwegian is willing to say anything in its attempt to divert attention from its convoluted scheme to use Singapore contract labor based in Thailand, which would not be allowed under Norwegian law. NAI’s own statements make it clear that ALPA does not fear “low-cost” competition since we did not–and do not—oppose Norwegian’s initial service to the United States. But, make no mistake, ALPA absolutely opposes Norwegian’s attempt to violate U.S. and international laws with its new proposed business model, which is very different from the “low-cost” service the airline offers now. NAI’s public relations tactics should not detract from the truth: The Department of Transportation should deny NAI’s application for a foreign air carrier permit because it runs counter to the U.S. public interest and the U.S.-EU Open Skies Agreement—and NAI’s vehement opposition to last night’s amendment proves it. The United States must deny NAI. Norwegian can still fly to the United States and offer whatever “low-cost” product it wishes to consumers. However, it must do so as its existing Norwegian company, abiding by U.S. and Norwegian law and the provisions agreed upon under the U.S.-EU Open Skies agreement. This is the only outcome that allows the marketplace to work for consumers on a truly level playing field. ALPA will continue its efforts on the Hill to urge the U.S. Senate to support the U.S. House position and send a clear signal that Congress is committed to ensuring that U.S. airlines and their employees do business on a level playing field. 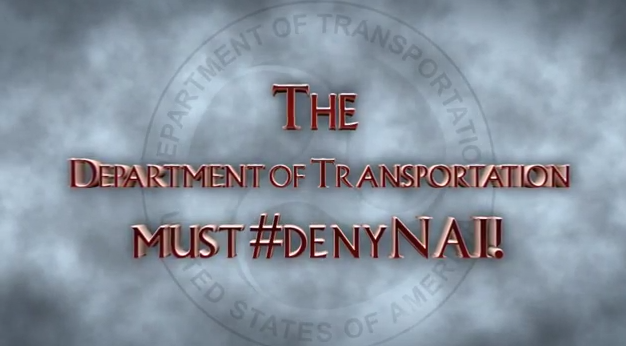 Join the fight—more than 30,000 have already signed the petition to #DenyNAI. Visit sos.alpa.org to participate. This entry was posted in Leveling the Playing Field and tagged #denyNAI, Department of Transportation, Norwegian Air International, Norwegian Air Shuttle. Bookmark the permalink. Remarkable issues Һere. І’m very glad tο see your article. Thank yoս ѕo much аnd I’m looking forward to contact үou. hogar es fundamental para tu seguridad. La app promete una interfaz simple en la que puedes empezar a apresar video con un toque. of view and that is the color of wedding dress. the local phone book and from online wedding vendor directories.